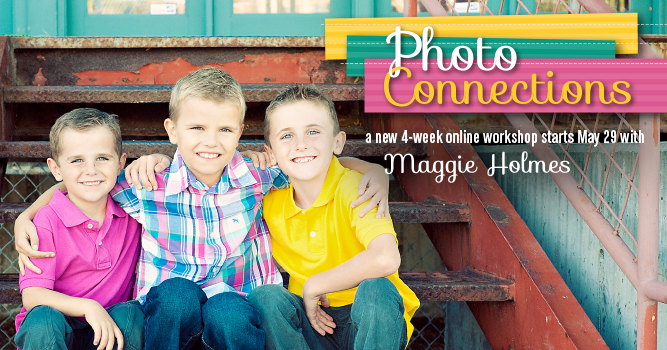 Maggie Holmes Photo Connections Class - Win a Seat! 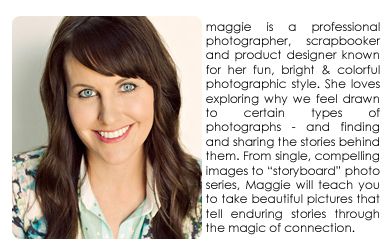 Big Picture Classes, the leader in memory-keeping classes, and Maggie Holmes, an absolutely amazingly talented scrapbooker, designer and photographer are teaming up to bring you Photo Connections: Capturing the True Essence of People and Relationships Through Photographs. Would you like to say goodbye to those awkward, posed photographs of friends and family members, where they're smiling dutifully at the camera but not authentically relating to each other—or to you as the photographer? Bonus projects from five amazing scrapbookers! During week four, contributors Stephanie Bryan, Kelly Purkey, Gillian Nelson, Allison Waken, and Maggie Massey will share paper-crafting projects that beautifully preserve some of their favorite photo connections. Did you see my name up there??? Yay! Yay! Yay! I can't even begin to tell you just how excited I am to be a part of this class. I'm honored and grateful and beyond stoked! And I can hardly wait for class to start. The Photo Connections class starts May 29th and registration for the class closes on June 4th at 10:00 pm. BUT, you can enter to WIN a seat in this remarkable class right here! Just leave a comment on this post telling me how excited you are for this class and then enter through the Rafflecopter below. Thank you so much for the chance! I'd love to learn how to make my subjects enjoy being in photos! This looks like an amazing class! Would love the chance to take it! Thanks!! Thanks for the chance to win! I would love a seat in this class because I produce the most boring "look and smile" shots. I try to be spontaneous and capture the essence of the moment, but it always ends up looking forced. UGH! Oh I want in on this class so badly. It has all my faves, including you. I've been saving up all my gold coins. Thanks so much Maggie for the opportunity. I really appreciate it. This workshop looks amazing & I would love to win. Maggie is a genius! This looks like an amazing course! I would really love to know how to make shots that show the relationships between people. That sounds amazing when all I can get are fake smiles! OOOOH! Your name being on the list of contributors makes this class even more exciting! It sounds like an amazing class and I love that it focuses on capturing that sense of connection. I am always interested in learning how to make my photos more representative of what I am trying to capture, and in general, just take better photos. This sounds like a great class....I really need some photography tips! to get ideas from her. I love taking pictures and could use some tips!!!! Thank you for this great opportunity!! I am over the moon excited at the possibility of taking a class with the fabulous Maggie Holmes and being inspired by all of the talented contributors!! Thank you for the chance to win! I would love to learn how to improve my photos. Thanks for the chance! I am sooo excited to take this photo class!! All the elements of a great family or friends photo come together when you learn how to make those important connections and take time for proper composition. I desperately need this class!! 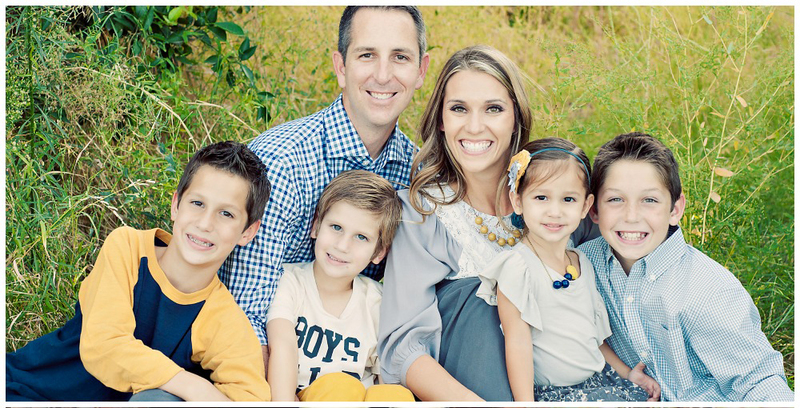 I've taken photos of my family for years and rarely get that "money" shot or the "keeper". I am always in awe of the photos that I see from Maggie Holmes, I hope to one day get those shots!! What a wonderful class! Would love to take this - thank you for the chance! I could really use some education to improve my photo taking and would love to see what you have to say! What an awesome give away! You must be so excited to be part of the class! That class sounds amazing! Just what this iPhone addict needs! Ooh! I hope I win! Maggie Holmes and Maggie Massey! What could be better:). Ooh, maybe if the prize came with some chocolate! ha! I've always been a fan of Maggie's mad photography skills. I would love to know how her brain works and be inspired! Thanks for the chance to win! Sounds like so much fun! Thanks for the chance to win!! Ohhh! This sounds like so much fun!! Thanks for the chance to win!! Wow! I soooo need to be in this class! I have never had any camera classes and def. need one! Thanks! UMMMM! I would love this class, she is freakin awesome! I would love this class because I really need to learn to take better family pictures! Thank for the opportunity to win!